Folse (2008, p. 14) It is important to define what we mean by second language vocabulary. When we talk about vocabulary, we usually mean words, but what is a word? Most people think of words as single units, such as cat, dozen, or reluctant. However, these single words are merely one part of the vocabulary load that our students face. In fact, a “word” can be one of five types, namely (1) a single word, (2) a set phrase, (3) a variable phrase, (4) a phrasal verb, or (5) an idiom. c) Ask students to construct a picture, symbol, or graphic representing the word. d) Engage students periodically in activities that help them add to their knowledge of the terms in their notebooks. 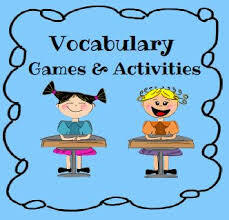 f) Involve students periodically in games that allow them to play with terms. a) Quickly give the meaning by (a) using an L1 translation, (b) using a known L2 synonym or a simple definition in the L2, (c) showing an object or picture, (d) giving quick demonstration, (e) drawing a simple picture or diagram, (f) breaking the word into parts and giving the meaning of the parts and the whole word (the word part strategy), (g) giving several example sentences with the word in context to show the meaning, (h) commenting on the underlying meaning of the word and other referents. b) Draw attention to the form of the word by (a) showing how the spelling of the word is like the spelling of known words, (b) giving the stress pattern of the word and its pronunciation, (c) showing the prefix, stem and suffix that make up the word, (d) getting the learners to repeat the pronunciation of the word, (e) writing the word on the board, (f) pointing out any spelling irregularity in the word. c) Draw attention to the use of the word by (a) quickly showing the grammatical pattern the word fits into (countable/uncountable, transitive/intransitive, etc), (b) giving a few similar collocates, (c) mentioning any restrictions on the use of the word (formal, colloquial, impolite, only used in the United States, only used with children, old fashioned, technical, infrequent), (d) giving a well known opposite, or a well known word describing the group or lexical set it fits into. Belum ada tanggapan untuk "Vocabulary Activities"